At Mercedes-Benz of Honolulu’s Service Center, we utilize only the latest factory-installed tools and technology to properly inspect, diagnose, and service your Mercedes-Benz to ensure optimal performance. Explore the specified Mercedes-Benz maintenance schedules below for new and certified pre-owned models alike. *Additional work may be required depending on your year, model and mileage. Call us at (808) 592-5151 for more details. 1 All G-Class models not applicable to above charts. Please see the maintenance booklet for service coverage. 2 Includes coolant, brake, power steering, windshield washer fluids and AdBlue® (diesel models). At Mercedes-Benz of Honolulu, our service menu pricing is more than competitive with independent service providers, not to mention other Mercedes-Benz dealers. Our factory trained technicians are experts at repairing any model of Mercedes-Benz. Any Mercedes-Benz, regardless of its age, will retain its value much longer when Mercedes-Benz authorized parts and factory trained technicians are used. Visit us, call us, or use our online scheduler to make a reservation for any Mercedes-Benz service or repair needs. All fluid level checks and corrections are dependent on factory-recommended service intervals for your vehicle’s year and model. Adhere to all require elements listed by model and year specific model as indicated on the corresponding service sheet for Mercedes-Benz Maintenance Systems in the USA. Maintenance Systems in the USA. Your Genuine Mercedes-Benz heating, ventilating, and air conditioning system not only keeps your vehicle’s interior comfortable, it also keeps the air in the vehicle cabin clean and eliminates some environmental allergens by first passing air through the cabin/air filter. It can also optimize defroster operation to ensure visibility. Furthermore, a well functioning air conditioning system can help maintain your fuel mileage. That’s why it’s important to have this system service periodically. Genuine Mercedes-Benz Brake Parts are designed and tested at the high speeds and extreme stresses of the German Autobahn ensuring their ability to bring you and two tons of accelerated machinery to a safe and sure stop, time and time again, under both routine and emergency conditions. Brake wear is a normal and necessary part of bringing your vehicle to a safe and reliable stop. The material and composition of Mercedes-Benz brake pads are specially developed to provide a balance between high-speed braking and brake-dust reduction because, after all, there may be no more important function of your Mercedes-Benz then the effectiveness of its brakes when called upon in an emergency. Includes all maintenance procedures recommended by Mercedes-Benz for this interval: change oil with Mercedes-Benz Genuine Engine Oil and replace filter, inspect for leaks and condition of all components, lines and hoses on the engine, transmission, level control, steering system, and fuel and brake systems. Inspect and adjust drive belts. Clean and inspect air cleaner element. Remove wheels and rotate tires (if applicable) as necessary. Inspect the brake system, measure rotors with micrometer and report remaining serviceability. Adjust parking brake. Check all exterior and interior lamps and windshield wiper inserts. Lubricate throttle shafts, door hinges and locks. Function check of most components. 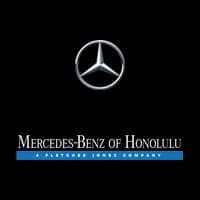 Perform recommended Mercedes-Benz of Honolulu 32-point inspection and road test. See your Owner’s Manual for specific service details. Note: Does not include replacement of activated charcoal filter at 75,000 miles. As an added value, Mercedes-Benz of Honolulu will also inspect all interior and exterior lamps, perform recommended 32-point inspection, and conduct road test. Lubrication Service (except V12, AMG®). Service includes draining engine crankcase and refilling with Mercedes-Benz Genuine Engine Oil. Replace engine oil filter. Visual brake inspection. Check and replenish all fluid levels. Check belts and hoses. Check interior and exterior lights. Perform recommended Mercedes-Benz of Honolulu 32-point inspection and road test. Transmission pan and torque converter are drained of oil. Transmission pan is removed, inspected, and cleaned. Transmission filter and pan gasket are replaced. Transmission is refilled with appropriate oil. *Please refer to your maintenance booklet for the complete list of factory-required services and details on the specific intervals for your vehicle’s year and model. **Services performed for Service A/Service B may vary due to your driving habits, mileage, and local environmental conditions. Please refer to your maintenance booklet for additional details and general guidelines for your vehicle’s year and model.